'Stalker' Red Schuhart makes a living by retrieving discarded high tech artifacts of alien origin from the 'Zone', a sector of his native Harmon which has been cordoned off subsequent to an apparently short-lived alien 'Visitation'. A large area of the town has been environmentally transformed by the arrivals and the numerous perils now encountered there such as ‘burning fluff’, the ‘spitting devil’s cabbage’, (p. 16), 'mosquito mange' and ‘witches’ jelly’ (shooting tongues of flame… pale blue… like burning alcohol’ (p. 26) that turn extremities to rubber) which have rendered it largely hostile to native lifeforms. The Zone also features numerous items of alien origin that appear to have been abandoned by the visitors on their departure. These include 'empties' (‘two copy disks the size of a saucer, about a quarter inch thick, with a space of a foot and a half between them. There’s nothing else.’ (p. 7)); pins (‘slightly blue [that] occasionally sputtered with other colours’, (p. 60); inexhaustible, self-replicating (p. 86) batteries (the ‘so-so’s’ mentioned in the last third of the book, which are adapted to run automobiles); bracelets; carbonated clay; sponges; 'itchers' (sonic disruptors that disorientate and immobilize); porcelain containers; hoops (which appear to exhibit perpetual motion), and 'black sprays'. Covertly visiting the Zone in order to bring these artefacts out, Schuhart serves both the government-run International Institute for Extraterrestrial Cultures (IIEC) that has been established next to the Zone to study the items (Harmon being one of six similar sites which appeared at the same time), as well as a criminal, possibly industrial, black market eager to experiment with them. Whilst accepting that there is no way of knowing who the aliens were, what they wanted and whether they would return, the Visitation is acknowledged to have been ‘a unique event that allows us to skip several steps in the process of cognition. Like a trip into the future of technology. Like a quantum generator ending up in Isaac Newton’s laboratory’ (p. 100). As the novella progresses and time passes (the novel spans at least eight years, according to the chapter subheadings that state the protagonist’s age), its tone becomes more gothic as those former residents of Harmon who had died and were buried in the Zone prior to the Visitation are somehow recomposed and reanimated as moulages. Their appearance, we are led to assume, is presumably a further consequence of the environmental influence of the artefacts left by the Visitors. Having come back to life of a sort, they proceed to return to their family dwellings as barely sentient moulds or casts of their former selves. The title of this SF Masterworks entry references the passage in which Valentine Pilman, one of the IIEC’s lead investigators into the Vistation, compares the study of the artefacts left behind by the aliens to animals, birds and insects that ‘creep out from their hiding places’ to examine the ‘gas and oil spilled on the grass. Old spark plugs and old filters strewn around. Rags, burnt out bulbs, and a monkey wrench left behind. Oil slicks on the pond. And of course, the usual mess – apple cores, candy wrappers, charred remains of the campfire cans, bottles, somebody’s handkerchief, somebody’s penknife, torn newspapers, coins, faded flowers picked in another meadow[…] [after] a roadside picnic’ (p. 102). Certainly, this invites a reading of the work as an environmentalist parable, and this interpretation has apparently found some currency with Chernobyl investigators who allegedly refer to themselves as ‘stalkers’, but I see this as a peripheral rather than a primary reading of the work. Schuhart also rather chillingly reconfigures the Visitation as a slow ‘invasion’ as children of the Harmonites are genetically altered, with his own daughter Monkey more simian than human, whose function deteriorates as the book progresses as ‘she understands less and less – almost nothing any more’ (p. 114). Again, however, this is an incidental interpretation. Viewing Monkey as a symbol of man’s slide back towards atavism in his pursuit of the debasing divagations of late capitalism, diverting humanity’s attention away from the critical issue of how best to advance the collective needs of its species-being seems more appropriate to me. Valentine quotes an unstated source: ‘”You ask me what makes man great? That he has re-created nature? That he has harnessed cosmic forces? That in a brief time he conquered the planet and opened a window on the universe? No! That, despite all this, he has survived and intends to survive in the future”’ (p. 103). However, humanity's tenacity is portrayed as being as much a curse as a blessing in the book. The Bratya Strugatsky appear to suggest that humanity has greatness within it, but if all it does is pursue the accumulation of wealth, its potential is squandered. This is a quandry that Noonan frequently poses to himself: ‘Sometimes I ask myself, what the hell are we all running around for, anyway? To make money? But what the hell do we need money [for] if all we do is run around making it?’ (p. 112). Schuhart, frequently blasting on his hip flask between bouts at the Borscht where he swigs four-finger shots of vodka, who is prone to violent outbursts, and scratches a living in the Zone with no future to speak of for himself, Guta his wife, or Monkey, their mutant child, may be a heroic protagonist with regard to his ability to endure suffering, but there is little else of the Homeric strain about him. He, along with the rest of the Harmonites, is bumping along the bottom of life. Whether or not the book exhibits any hope for humanity is perhaps its most interesting aspect. Much of the tension within the work focuses upon whether the mysterious artefact the Golden Ball really exists. The old-time stalker Burbridge dismisses the Golden Ball as a myth: ‘there were so many tales about it. I spun a few myself. That it would grant your every wish. Any wish, hah! If that were true, I wouldn’t here. I’d be living high on the hog in Europe, swimming in dough’ (p. 48). This is a theme reiterated by the supervisor of the electronic equipment supplies for the Harmon branch of the IIEC, upon whom the third chapter of the work focuses, who states ‘the Golden Ball is a legend[…] a mythical artefact located in the Zone in the shape and form of a gold ball that grants human wishes’ (p. 88). Schuhart enters the Zone for the final time having discovered the location of the Golden Ball. He takes along with him a third party, Arthur, who unbeknownst to him is nothing more than a coldly calculated sacrifice to the ‘meatgrinder’ environmental effect that destroys the first person attempting to approach the Golden Ball. His ‘talking key’ fulfills his function in the manner Schuart expects him too, but immediately before he is destroyed by ‘transparent emptiness’, Arthur begins to rave: ‘Happiness for everybody… Free!... As much as you want!... Everybody come here!.., There’s enough for everybody! Nobody will leave unsatisfied!... Free!... Happiness!... Free!’ (p. 143). Arthur's dying words refer the reader back to a speech Schuhart has blurted out earlier in the work that his subsconscious, or so he allows himself to think, has culled largely from his interactions with the scientist Kirill who ‘had been struggling with those empties forever[…] without any benefit to humanity or himself’ (p. 9): ‘our little town is a hole. It always has been, and still is. But now it is a hole into the future. We’re going to dump so much through this hole into your lousy world that everything will change in it. Life will be different. It’ll be fair. Everyone will have everything that he needs. Some hole, huh? Knowledge comes through this hole. And when we have the knowledge, we’ll make everyone rich, and we’ll fly to the stars, and go anywhere we want. That’s the kind of hole we have here… The amazing part was that I believed it in my guts as I said it to him’ (p. 36). Interestingly, Schuhart breaks off his rant ‘feel[ing] uncomfortable’. ‘I don’t’, he remarks, ‘usually like using other people’s words, even when I agree with them. Besides, it was coming out kind of funny’ (p. 36). Resting before the final confrontation, Schuhart meditates: ‘he sat there, covering his eyes with his hands, and he was trying – not to understand, not to think, but merely to see something of how things should be, but all he saw were the faces, faces, faces, and more faces… and greenbacks, bottles, bundles of rages that were once people, and columns of figures. He knew that it all had to be destroyed, and he wanted to destroy it, but he guessed that if it all disappeared there would be nothing left but the flat, bare earth’ (p. 145). Finally, as he approaches the Golden Ball himself, Schuhart begins to address it: ‘I am an animal, you see that. I don’t have the words, they didn’t teach me the words, I don’t know how to think, the bastards didn’t let me learn how to think[…] Damn it all, I can’t think of anything except those words of his… “HAPPINESS FOR EVERYBODY, FREE, AND NO-ONE WILL GO AWAY UNSATISFIED”’ (p. 145). In the last instance, the reader's interpretation of Roadside Picnic hinges upon their interrogating whether the Visitation was in fact a mission, a purposeful attempt on the part of a benevolent alien culture to save a misguided humanity from itself by re-orienting its low obsessions and attempting to instill Schuhart’s race with loftier ambitions, which (and a very downbeat conclusion this would be) failed as a consequence of the impossibility for even advanced cultures to transform our primal self-interests. Nothing but broken tools and the evidence of the aliens’ failure remains, including their attempts to get around humanity’s irreducible selfishness by genetic modification (with Monkey and the moulages being the terrible consequences of their nonachievement), and their neurolinguistic programming (such as Kirill, Arthur and finally Schuhart succumb to, but not, interestingly, other characters such as Burbidge). A more upbeat post-textual conclusion would be Schuhart’s wish being granted, but he need only need use his eyes to see the chaos and decay around him to realise that the artefact is incapable of bringing them to fruition. 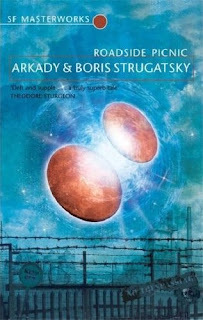 A slender, thought-provoking, fast-moving title, Roadside Picnic is an eminently re-readable addition to the SF Masterworks series. I only recently read this one, so I was excited to read this review. Well done by the way - your reviews go far deeper than a simple plot overview to get to the core themes and issues presented by the book. This review certainly shed some light on "Roadside Picnic", which is one of those books that I'll need to read a second time to fully appreciate. When I finished, I wasn't quite sure what had happened. Hopefully it will make more sense upon re-reading. Thanks for stopping by, and your comment, which is much appreciated.